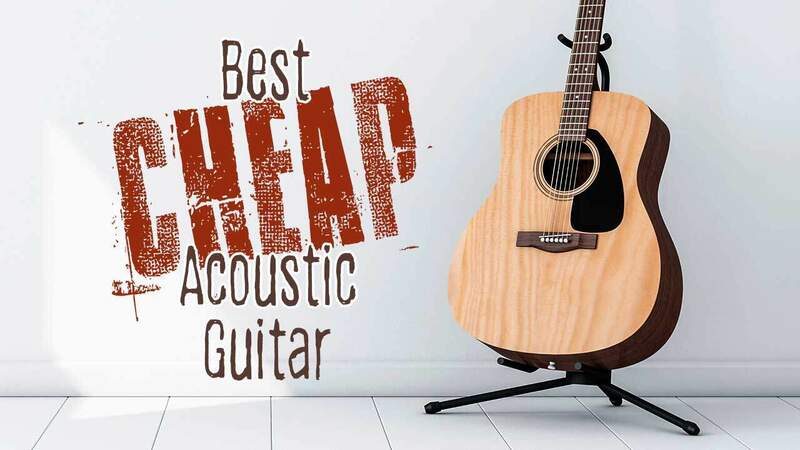 On a budget and looking for the best cheap acoustic guitar? Our expert buying guide will give you the advice you need to make a good decision. 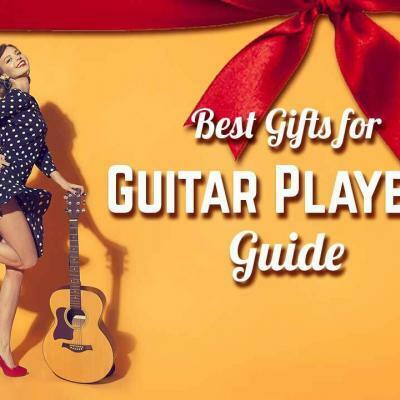 Choosing a good beginner acoustic guitar will definitely help the journey for someone who has a desire to play music, without breaking the bank. You or your child’s love for music shouldn’t be hindered by a lack of funds for a musical instrument. 1. 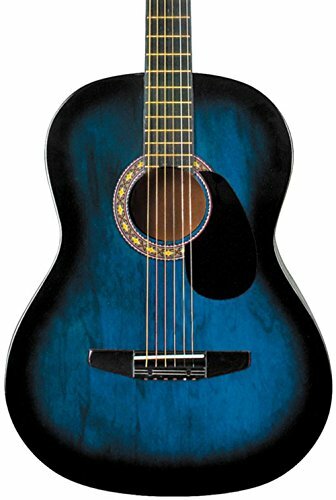 Jasmine S35 Acoustic Guitar Best full-size cheap acoustic (4.2 / 5) View Now On Amazon! 2. Rogue Starter Acoustic Guitar Well built and large enough to last as you grow (3.9 / 5) View Now On Amazon! 3. 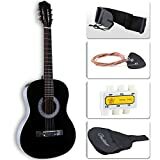 LAGRIMA Beginners Acoustic Guitar Best all-in-one package for beginners (3.8 / 5) View Now On Amazon! The Jasmine S35 Acoustic Guitar is made not only for beginners, but also for more seasoned guitar players. It comes in a dreadnought shape which helps produce that big and bold sound. The top is made from spruce and the back and sides are both from laminated nato. It has the Jasmine Advance “X” Bracing to help provide adequate support to the guitar and to help produce that bold sound. The neck is slim making it easier for beginners to practice playing chords. It has a satin finish for better resonance and for the best sound quality it can provide. It is a right-handed guitar with a natural finish, and it can be bought alone or as a package with additional accessories. This is the best cheap acoustic guitar for players who don’t mind tweaking their guitars to improve the sound quality. What Do Jasmine S35 Players Think? It needs to be properly set up and tuned first before it can sound great. Video tutorials can help, but beginners may find this challenging to do on their own, so they may need to pay for it at a guitar shop. The Rogue Starter Acoustic Guitar is especially made for kids who want to try playing a guitar. The smaller 7/8 size makes it more lightweight and comfortable for younger students. The Rogue has reasonably low action making it perfect for small hands and fingers. This makes it the best cheap acoustic guitar for kids and aspiring guitarists. The guitar is also a great choice for those who have children but are concerned about ruining a more expensive instrument. 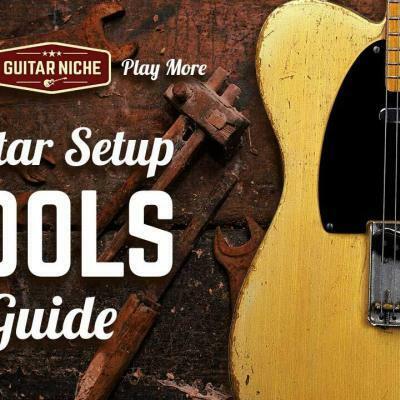 Buying a an entry-level model of this size gives beginners a reasonably well built guitar of their own that they can grow into for quite a few years. Like any inexpensive instrument, it may not really hold the tune without having it set up. Nonetheless It is very affordable and a great gift for a young music enthusiast. 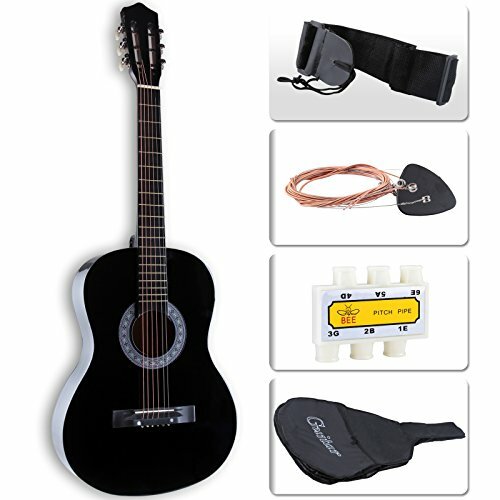 The LAGRIMA Beginners Acoustic Guitar comes with a set of accessories that beginners will find useful as they learn how to play the guitar. It is a great guitar for kids who are old enough to learn how to really play the guitar and not just play with it like a toy. It has an all wood construction and a smooth finish that helps it to resonate better and produce a reasonably good sound. The guitar makes use of steel strings that can be tuned but may need retuning after some use. 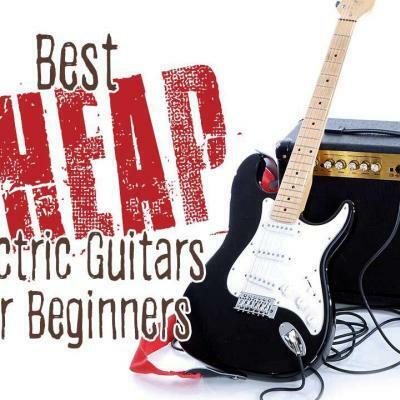 It is the best cheap acoustic guitar for beginners who are still figuring out if they are serious about learning how to play the guitar. 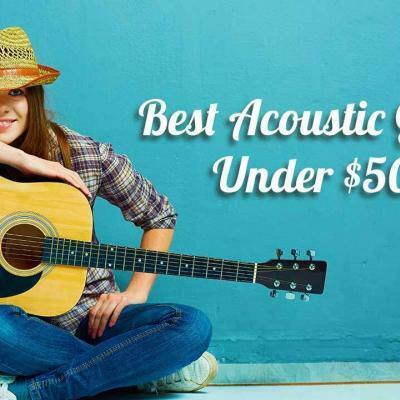 Out of the three acoustic guitars found above, the Jasmine S35 Acoustic Guitar is the best cheap acoustic guitar for young people and adults alike. It has a dreadnought shape and it is made from an all-wood construction. This helps produce a full and good quality sound. This guitar may be the most expensive of the three but it can surely outlast the other two. It is a great guitar that you can tweak to further improve the sound. This is a good guitar to learn from and to simply enjoy playing music that you love. Lastly, it’s important to note that most guitars in this price range benefit greatly from having a little bit of setup work done to make them as playable as possible. An acoustic guitar is a great instrument that you can use to get started playing music. 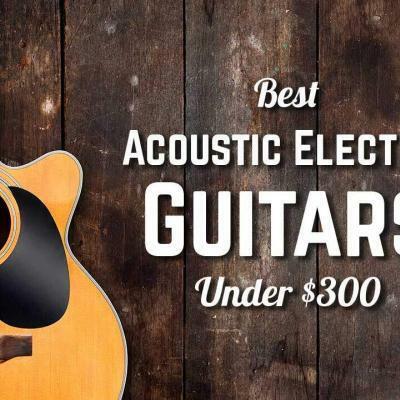 Whether you plan to play the guitar to rise to stardom or you just want to enjoy playing some of your favorite tunes, selecting a reasonable budget acoustic guitar is very important. 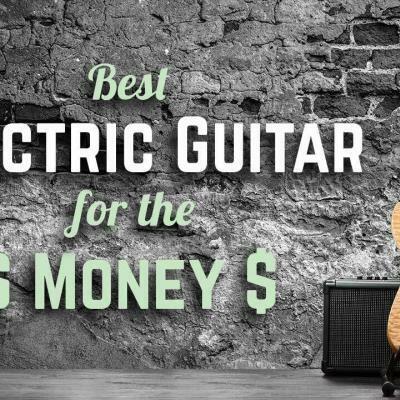 The first thing that you should determine a budget to spend for a guitar. It’s best to set a realistic budget and work with it and not against it. If you’re really on a tight budget, start searching for cheaper models and figure out if you can tweak them to improve them without costing too much. Not all the inexpensive models are of low quality; there are many that are decently priced and can allow you to learn with relatively little difficulty before you upgrade to a better one. When it comes to acoustic guitars, the shape and size of the body affects the sound it produces. Larger guitars are likely to produce a deeper or fuller sound than smaller ones. The only drawback is that a very large guitar may not be comfortable. It’s important to find a balance between the size and shape of the guitar that you select, and the comfort that you have while playing it. For instance, if you’re buying a guitar for a child, you want an instrument that fits their general body size at their present age. As a standard example, a three-quarter size guitar is suitable for children ages 10-14. By comparison, a full size acoustic would be far too cumbersome and take them many years to grow into. Many acoustic guitars are a dreadnought shape because of the good quality of sound it produces. Mostly selected because it can be used for different styles of music from rock to country to the blues. The great thing about this shape is that it also produces a big sound, though it comes at the cost of comfort by having a bigger body. Aside from the body shape, the neck size and the action of the guitar also affects the comfort and sound. There are guitars with smaller necks that make it easier for beginners to learn and practice barre chords. There are also low-action fretboards, which have the strings close so that it is easier for beginners to press on them. Low-action fretboards are great, but they may also be prone to fret buzz. Guitars may come in different colors and different finishes, and the appearance of your guitar is a personal choice. The type of materials or wood used can also affect the appearance of the guitar. More importantly, it can also affect the sound quality because different kinds of wood have different effects to the sound. It is quite common to find guitars with laminated tops that are made from spruce, maple or pine, and some even make use of cedar. 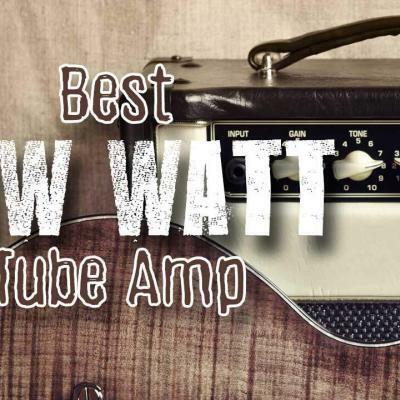 These inexpensive tops are still resonant and will typically produce a bright sound. Mahogany tops are less common but they still produce a beautiful, slightly deeper sound. For the fretboard, rosewood is mostly used. Many guitars that are really cheap may have flaws in the finishing. They may not look as great but they can sound great if you just give them some love. Even if you buy a very affordable guitar, there are ways you can improve them and upgrade them without spending too much or essentially, buying a new one. One easy thing you can do is replace are the strings. Most factory strings that come with the guitar are not necessarily that great. They will produce a sound, but you are far better off with a branded set of strings such as D’Addario, Martin, Ernie Ball or one of the many other fine brands. Another upgrade would be the tuners, sometimes called machine heads. 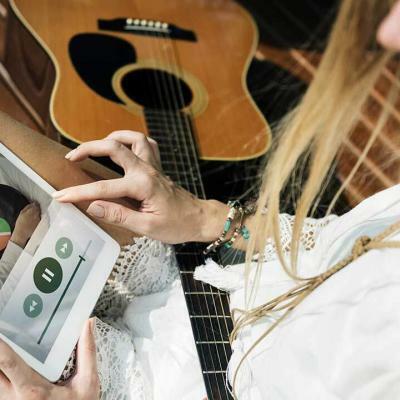 With an upgraded set of tuners, you can expect your guitar to more stable, staying in tune for a longer period of time. You won’t need to tune it as often, unlike what you’d expect with the typically sloppy tuners that come with cheaper guitars.